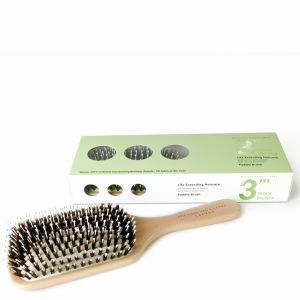 The ultimate hair styling tool, this Paddle Brush from 3" More Inches efficiently and effortlessly detangles the hair with minimal breakages. With smooth bristles that boast ball point ends, embedded on a cushioned base to reduce impact, this hair friendly brush detangles the hair without breaking or tugging and also massages the scalp to improve blood circulation. K.D. Keep a 2cm distance from the tip of the hairdryer nozzle to avoid damage to the hair and the brush. Occasionally wipe your brush with warm soapy water to remove product residue. Rinse and allow to air dry. Do not immerse the brush into water.